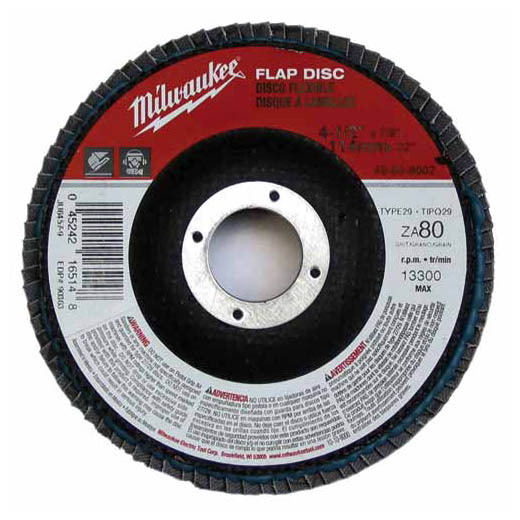 Milwaukee Flap Discs grind and finish in one operation. They are manufactured using a high performance Zirconia grain that outlasts standard Zirconia and Aluminum Oxide grains by up to 30%. Milwaukee Flap Discs are available in 36, 60, and 80 grit and come in the following diameters/configurations: 4-1/2 in. (Type 27, Type 27 Extra-Thick and Type 29), 5 in. (Type 29) and 7 in. (Type 29).